All DoSiRak bowls come with a base of white rice. You can choose to change your base or add more ingredients. "Everyone loved it and we may order from here mo..."
DoSiRak is a food & beverage restaurant that provide healthy & tasty food to their customers and is much loved by their customers. Their mission is to serve healthy and delicious food without enhancers such as MSG, or refined sugar so that the body can process it naturally. DoSiRak believes in "Food With Value" and that comes from a balanced well-cooked meal with carbs, vegetables, and proteins. DoSiRak also uses fresh ingredients to produce high-quality meals to their customers. 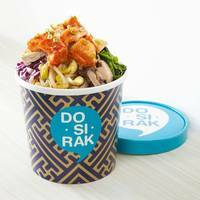 DoSiRak's menu features Healthy, Convenient Halal Korean Lunch Bowl Packs and they're sure to be your favorite. Their popular menu includes Beef Bulgogi, Spicy Chicken, and Crab & Fish Roe. Their Beef Bulgogi comes with spinach, red cabbage, bean sprouts, carrots, and onions. Their Spicy Chicken comes with cabbage, spinach, bean sprouts, carrots, and onions. Their Crab & Fish Roe comes with bean sprouts, carrots, onions, cabbage and yellow radish. Looking to get DoSiRak delivered to you? Dosirak delivery is available for breakfast, lunch, and dinner in Singapore. Make sure to check their schedule for delivery times, which is usually 5 days a week and do note that their menu requires 1-day notice for placing orders, so don't be disappointed! Thanks to Caterspot, you can have DoSiRak to cater to your needs and preference. You can simply place your order via our website. Alternatively, you can also call our hotline. Our friendly staff will be pleased to assist you with your booking or any enquiry. In Caterspot, we provide a seamless experience and convenience to our customers: once you have placed your order, you can count on us to deliver tasty and fresh DoSiRak menus to your location.